2011, Eddie Murphy, Ben Stiller, Matthew Broderick, Michael Pena, Tea Leoni, Alan Alda, Casey Affleck, Gabourey Sidibe. Directed by Brett Ratner. I have been a fan of Eddie Murphy for a long, long time, all the way back to his phenomenal presence on Saturday Night Live. I love him in the Beverly Hills Cop movies, Trading Spaces, and Coming to America, too. I really enjoyed his Nutty Professor and even Daddy Daycare. Ben Stiller is also responsible for some of my favorite comedies like Night at the Museum, Tropic Thunder, Zoolander, Meet the Parents, Dodgeball, and more. When I heard that they would both be in Tower Heist, I was anxious to see just what a fantastic comedy it would be. 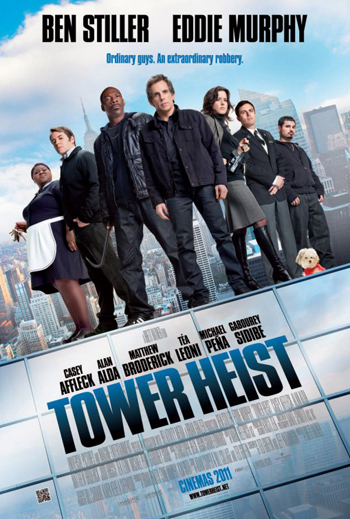 The more I heard about Tower Heist, the better it sounded; the stars were packed in like sardines in a can! The premise seemed to be both topical and a perfect excuse for a group of ordinary guys to get away with millions. Employees of an exclusive apartment building asked one of the wealthy residents to invest their retirement funds, only to discover too late that the investment is a Ponzi scheme and they have all been swindled out of their life savings. (Sounds a lot like Bernie Madoff, doesn’t it?) Alan Alda as the crooked businessman, Ben Stiller as the building manager who feels responsible for his coworkers’ plight, Eddie Murphy as the petty crook providing a crash-course in thievery to a motley crew of inept innocents – these are the ingredients of a top-notch, fast-paced, hilarious caper. There are some priceless scenes where Eddie Murphy’s character is attempting to train Ben Stiller’s crew in the finer points of crookdom. Michael Pena is excellent as the eager young man who may not be as accomplished as he thinks. Matthew Broderick is a hoot as the timid doomsayer who goes along with the gang because he literally has nothing left to lose. Casey Affleck adds a nice touch as the nervous father-to-be who has everything to lose. When the action finally gets around to the actual heist referred to in the title, there are some amazing complications that elicit gasps between guffaws. This movie had the all-star cast and all the elements of an uproarious comedy classic. Except… it wasn’t. Maybe there were too many subplots that had to be explained. Maybe there were too many implausible coincidences. Maybe there wasn’t enough focus on the planning of the heist. Maybe there wasn’t quite enough focus, period. I don’t know what the ultimate problem was, but this movie could have been better. Somewhere along the way it fumbled and fell short of its potential. That’s a real shame, too, because Murphy and Stiller are capable of delivering so much more. My advice is to catch this one on cable. 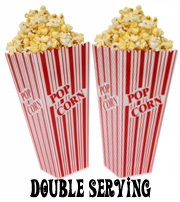 You will be entertained without the disappointment of having paid good money to see it in a theater. This entry was posted in Movies and tagged Ben Stiller, Brett Ratner, caper, comedy, Eddie Murphy, ensemble, Matthew Broderick, Tower Heist by S.D. McPhail. Bookmark the permalink. Made me laugh and held my interest more than it should have, given how sloppy it is. Call it an acceptable bit of B-minus work from a C student. Good review. Check out mine when you get the chance. Oh! How disappointing! I was counting on much more judging by cast. I adore Ben Stiller. Another great Jewish male actor. 🙂 I will try to see it, anyway, when I have a chance.